Bloggers, eh? Bunch of part-timers, the lot of them. Term has ended, along with my university career, which can only mean that summer has begun. It is therefore time to commence several long months of sun (possibly), relaxation (definitely) and self-improvement (yeah, right), an opportunity to unwind and prepare for the next stage in whatever I'm up to. I'm going to try to keep posting here for much of the summer (as long as the world obliges by providing interesting things to post about), but for the next few weeks, at least, that's going to be difficult - I'll have very limited internet access and not much time that I'll be willing to spend in front of a computer screen even when I do have that access. As such, The Beautiful Hypothesis is going on hiatus for a while. Keep an eye open for me...there will be new content when I return. As of today (being Monday, although once again I have pushed this post back through internet magic to Sunday), I am no longer resident in Oxford, and unlikely to be for the foreseeable future. I have an Alumnus card in my wallet, a graduate email address, and a set of crosshairs hovering over said wallet, aimed by the Development Office of my college as they gear up to begin extracting money from me. 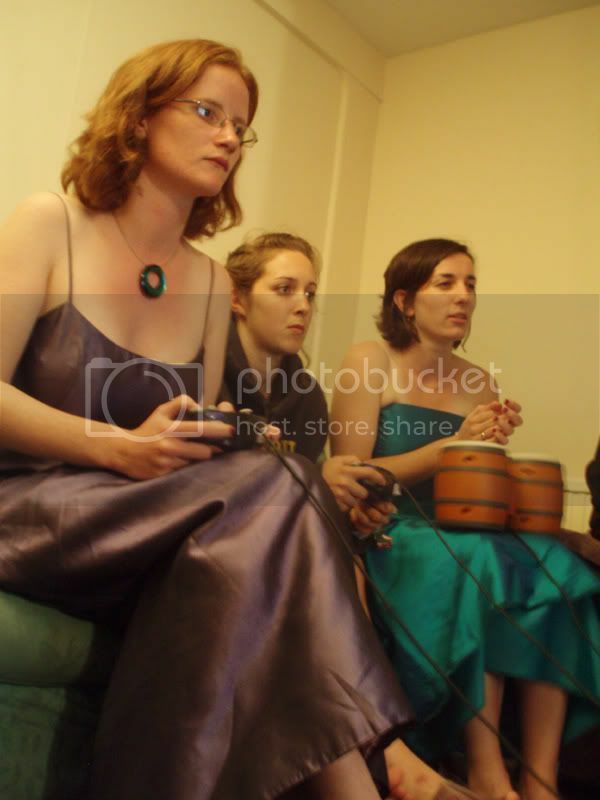 Almost the last thing I did in Oxford was to attend the college ball - this week's picture shows what happened shortly afterwards, as people returned to various student houses to do serious, grown-up things like playing Donkey Konga. Apart from this being a great game, it's also fun just to enjoy the sheer weirdness seen in the picture - girls in beautiful ballgowns, having just been to a very formal event (well, formal until the band started playing Sweet Home Alabama, at least), concentrating hard on a videogame with one of the silliest concepts ever devised. A fitting end to three years, I think. Another very quick one-link post for you today, this time from the Seattle newspaper The Stranger. The paper, noticing that Seattle is not renowned for its religiosity, sent 31 reporters off to various places of worship on a single Sunday (and a Saturday in the case of the lone Jewish service) to describe what they found. The article largely speaks for itself, so I'm not going to analyse it at all, but I will reproduce here a couple of points that I thought were particularly relevant or striking. "If you're thinking of attending a church, I beg you not to attend the CFC—find one that understands humility and grace and charity. I'm an atheist, but the CFC brings Bible imagery to my mind. Standing in all the gaudy sound and tacky fury, all I can think of is the perverted temple that Jesus Christ ripped to pieces with his bare f***ing hands." "I've heard this is a conservative, Fundamentalist church, but in the hour and a half I spent there, it didn't show. The members just seemed really into Jesus." "The music was typical of 'praise' music: formulaic pop-style love songs with 'girl' and 'baby' replaced by 'Jesus' and 'Lord.'" "On this Sunday, the Eucharist is, fittingly, the topic; the service is marked by humility, with discussion of feeding those in need, of spiritual hunger. The priest quotes Andre Dubus's Broken Vessels. The fundamental, communal acts of eating and drinking—body, blood—are consecrated. More than one person remains behind, watchful, possibly reverent, as the feast of Corpus Christi is enacted. If one feels like a trespasser, there is the sense that one's trespass is forgiven." "In an era when Christianity is marketed as a sort of rock concert meets Gatorade commercial—with TV-screen preachers beamed into makeshift houses of worship in high-school gyms—St. Mark's splendor is awesome. I understand the populist impulse of the evangelicals, but God deserves some gentle beauty." "In today's emerging churches, you lift both hands up toward heaven, arms out, in what looks like a sort of double-armed fascist salute. It's a posture that screams, "Look at me, God! I'm praying! To you!" The more enthusiastic worshippers looked like toddlers reaching up for Daddy, anxious to be picked up and hugged past their comfort levels." "So I mustn't forget / No I mustn't forget / To stop the spread of Communism / I mustn't forget..."
If you grew up in the UK at about the same time as me, it's an odds-on chance that you'll recognise the following lines. All the things I love so well. This, of course, is the first verse and chorus of the classic "Autumn Days" by Estelle White, taken from the songbook "Come and Praise" as seen in primary school assemblies all over the country. I can't remember offhand which volume of C&P it's from - it's either the blue one with the creepy solarised children on the front, or the green and yellow one - but the fact that it's so non-religion-specific as to make it entirely useless for worship under any organised religion suggests it's probably from the latter. I always used to enjoy singing this one when I was small - it had its own very entertaining little moments, such as everyone roaring "AND A WIN FOR MY HOME TEAM" at one point, and some of the imagery is beautiful. However, it's only when I look back on it now that it starts to look a bit weird. Read that first verse again, taking particular note of the last two lines: "Jet planes meeting in the air to be refuelled / All the things I love so well." When was the last time you ever saw a plane undergoing in-flight refuelling? I know for a fact that I've never seen it, and I very much doubt that this is different for most other people. The reason for this is that, unsurprisingly, in-flight refuelling is very difficult to do successfully. There are several systems for doing so, which have been developed over the years - back when transatlantic aeroplane crossings were a rarity, large flying-boats were refuelled in flight to give them the ability to make the journey in one go, for example. Since the advent of airliners capable of making long-haul flights, though, the technique has more or less been restricted to those aircraft that need to be make critical very long-haul flights, and are carrying things that are too dangerous to risk landing often. If you haven't noticed where I'm going with this - the only aircraft that fit this description are military. According to Wikipedia's terrifyingly detailed article on the subject, almost every air operation in the 2003 invasion of Iraq was refuelled in flight, and it was apparently not unusual for bombers in the first Gulf War to carry out operations lasting well over a day, staying in flight for the whole thing. With this in mind, "Autumn Days" starts to take on a rather sinister meaning. Remember, it was written (and sung) in the Cold War, a time when we could have been tipped at any moment into an all-out nuclear holocaust. Teaching children to include in their list of the "things they love so well" the sight of military jets constantly overhead has more than a slight air of Big Brother about it - it provides a mental image of children looking up to the skies, not to thank God (or even a non-specific deity) for all the things they've received, but to be comforted at the sight of their nation's air force circling silently above them, waiting to defend from the faceless enemies overseas should they ever make their final, deadly strike. Not having really been old enough to appreciate what the Cold War was while it was going on (I vaguely remember the USSR breaking up, but it meant nothing to me other than a new name on the map), the song clearly didn't manage to have this effect on me. I do wonder, though, whether it was an entirely accidental choice of imagery on Ms. White's part - or whether there were kids, perhaps not much older than me, for whom "Come and Praise" was filed into the same mental space as "Protect and Survive". I use Microsoft Outlook to check my email at the moment, mainly because it was already on my laptop when I got it, and I've inherited a World War II-style mentality from my parents which means that I never, ever waste anything that could be remotely useful. (It was only relatively recently that my mother disposed of her collection of deodorant bottle lids. I wish I was joking.) More recently, the definition of "remotely useful" that I use has shifted slightly, based on how frequently I use different programs or utilities - for example, I use Firefox rather than Internet Explorer, despite having a copy of IE, because I spend a lot of time on the Internet and Firefox is noticeably better for a number of tasks. The chances that I'll drop Outlook, then, increase as I use email more often, but haven't yet reached the point at which it's worth switching to Thunderbird or something similar. That point did get much, much closer today, however, when Outlook decided to crash while carrying out the extremely arduous task of connecting to my Hotmail account. I sent in an error report (because I have also inherited boundless and indefatigable optimism from my parents) and got a link back for more information, which I dutifully followed. Below is the complete text of the page that I reached. The problem was caused by Microsoft Office Outlook 2002, which was created by Microsoft Corporation. Microsoft Office Outlook 2002 is in its "Extended Support" phase. This phase of support for Microsoft Office Outlook 2002 began on July 11, 2006. Only security-related solutions are created by Microsoft for this version of Microsoft Office. Consider upgrading to the latest version of Microsoft Office to receive full support. Go online to learn how to upgrade. We also recommend that you periodically go to the Office Update website. This will help to ensure that your computer stays updated with the latest updates to Microsoft Office. How about including, you know, maybe some information beyond "give us more money so we can give you the next version of our software which will also crash at inopportune moments"? The advice "upgrade to the new version" is spectacularly unhelpful, and seems to give the impression that it is somehow normal for your software to spontaneously stop working once a new version comes out. Of course, I made a mistake in writing this - I forgot that it is, in fact, completely normal for most software (not only that written by Microsoft, although they're one of the most notable offenders in this regard) to spontaneously stop working at any and all moments. I was enormously entertained to read this story recently, in which we discover that the usual way of dealing with computer problems on board the International Space Station is to switch it off and switch it on again. I have no doubt that in the future, when we're all using flying cars and linking up our cybernetic implants with the Internet in order to have video clips of robotic cats doing cute things projected onto our eyeballs, the same problems are going to keep on coming up, time after time. Any bets on when the Blue Retina of Death is first going to appear? Youtube has just announced that they have created a number of country-specific versions of their service, so now it's possible to visit Youtube UK (for example) instead of the main US site. While I don't have any problems with this in principle, I am completely mystified by their explanation for going international in this way. From their blog post linked above: "Video is universal, and the incredible variety of the international content that we see on YouTube confirms just that!" They then go on to announce that they are "looking forward to seeing communities develop between people in their local communities as well as among people around the world". Err...surely that means that they've basically just corralled everyone into their own country-specific areas, reducing international interaction? It has been a quiet week in Lake Wobegone, or "Oxford" as some like to call it. Having no work, although very entertaining, does tend to leave me at something of a loose end. Luckily, though, Oxford has enough entertainment to keep one...err...entertained, and it has done so this week, as I have been (on various days) a tourist, a world-weary city resident reading under a tree by the river, a spoilt brat greeting over-privileged people out of their exams (ahem), and the kind of person who stays up late and sleeps past noon. 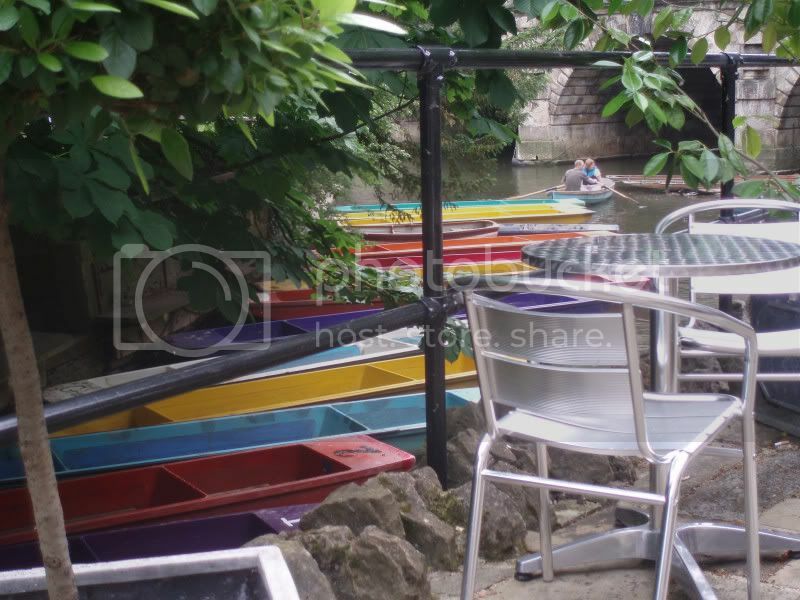 This week's photo comes from the first of my various guises, and was taken in Magdalen College, looking at the colourful punts that are hired out to tourists. The tributaries of the Thames that run through Oxford have been central to the city's development, even to the point of providing it with its name, and it's very pleasing for some reason to think that they continue to provide so much for what must be one of the city's most profitable industries. Wikipedia is a wonderful resource for all sorts of things, despite its many flaws. There isn't space here to go into the arguments over precisely how reliable it is (yes, I know Blogger doesn't restrict the amount of text you enter, so technically I have infinite space - believe me, that still isn't enough for some people), but it is undoubtedly one of those places where you can find vast quantities of information, some of it fascinating, some of it useless, some of it shocking, some of it just plain weird. Many articles fill an encyclopaedic niche that you never knew existed - for example, Wikipedia offers a nearly exhaustive list of songs whose title constitutes the entire lyrics, at least one conspiracy theory which is beyond weird and plunging right into "utterly bizarre", a list of comic book superpowers along with accompanying articles for some of the superheroes who possess extremely bizarre ones, a selection of plants possessing edible leaves, and the complete results from the boxing events at the 1968 Olympics. We won't even touch the vast numbers of articles dealing with every single one of the 493 types of Pokémon - I think you can see them for yourself if you're remotely interested. It's not just the articles themselves, though, which are fun to read - otherwise dull articles can also suddenly redeem themselves by bringing in an entirely off-the-wall section. Consider, for example, the Gallery Of Interesting Sideburns. I did not need to see several examples of this particularly odd facial hairstyle, but now that I have I am extremely grateful. Or we could go over to the world of music and see a list of well-known contemporary music written in the key of E minor. Some sections seem to have been written by someone who thinks that they're rather more important than they actually are - for example, the four-line section entitled The Health of Julius Caesar (Complete With Portentous Capital Letters). And sometimes you get a good old-fashioned pile-in, in which every visitor to an article decides that their bit of trivia must find a place somewhere - this "In popular culture" section, as happens pretty much anywhere a similar section appears, is an excellent example. Apparently, the "ø" symbol is pronounced "ur"
This car may appear to be entirely innocent. See it sitting there, not doing any harm. Why, you might almost want to get in and drive off. But that would be a grave and terrible mistake. For this car...this car is Dethwägøn. We're back in Jersey once again with this post (probably for the last time, unless I suddenly remember something vastly important that I feel I must relate), to talk about cars. In Jersey, you see, the automotive laws work differently to in the UK. 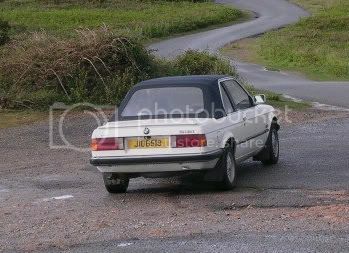 Specifically, there is no MOT test, meaning that it is perfectly legal to run cars until they drop dead of exhaustion - and, given that this means that cars that could not possibly pass an MOT in the UK can be sold and registered freely on the island, there's quite a few cars like our Wägøn. This particular car really does deserve its heavy metal accents, as it is surely one of the most effective ways ever devised of confronting yourself with the horrific substance of much of the metal genre - you know, death, terrible injuries, diseases, everything like that. The list of things that were going wrong with it would probably be impossible to definitively set down, as it seemed to be gaining more with every passing minute, but there were a few that were particularly worthy of note. First, of the fuel inserted into the engine, probably about half actually got burnt in the pistons. The rest, happily vaporised and floating through the air, eventually made its way either into the lungs of the passengers or into the huge cloud of black smoke left hanging in the air every time the engine tried to work remotely hard. This did mean that when driving across the island, the car following us in the large family convoy didn't have any difficulty knowing which way we'd turned, but on the other hand they did have a bit of problem with the quality of the air we left them. We weren't quite sure by the end of the journey whether the hilarity in the car was due to the inherent humour of the situation, and how much was due to excessive carbon monoxide levels. The second major problem with the Wägøn was that it had quite a bit of difficulty with starting. Well, that's not quite true. The engine started OK - the problem was that we had to do it rather a lot, as every junction, traffic light and slow-moving car ahead of the Wägøn caused it to die pathetically. Due to the above-mentioned clouds of black smoke, pushing the engine at all hard, which was what we had to do when restarting, was to be avoided - we therefore had to take pretty much every possible precaution against having to stop, even for the shortest moment. This strategy might have worked, had we been located anywhere other than a tiny island with little twisty roads and hills. Our only actions in this regard ended up being frantic hand signals to the car driving in front of us in the convoy - for some reason, manically waving your hands backwards and forwards while bellowing "FASTER! NEED TO GO FASTER!" seems to be an internationally-recognised signal. There was one other practical effect of our inability to stop, but this one was only seen once, in a large car park from which our convoy was just about to depart. The Wägøn was running, and we were fairly dubious about the prospect of trying to start the engine if it failed us again. So in we piled, and then proceeded to drive round and round the car park, shouting through the windows to the other members of the convoy to try and determine where we were supposed to be going next. What the poor patrons of the restaurant whose car park it was must have thought, I can only imagine. Convoy driving has its own little quirks at the best of time, which are compounded if the vehicles have rather different abilities. We were certain, for example, that if we took the Wägøn down certain hills, we'd never get it back to the top - this frequently necessitated very creative route-finding. The communication between the cars had similar shortcomings, such that there was one point at which we turned one way, found that the car in front of us had stopped for petrol, and turned round and came back. At this point we misunderstood their cheery waves for driving directions, so we turned round again. This time, as we came past the petrol station again, the hand signals definitely meant "wrong way", necessitating another three-point turn (during which the engine, predictably, died again), and another trip along the same strip of road. Whether the petrol station's proprietor had seen us merrily sailing past his establishment four times in as many minutes is something that we shall sadly never know. We certainly didn't see him when we went past yet again, roughly three minutes later. So, what can we learn from this experience? Well, first (and pretty obviously), no matter how much we moan about it, the MOT test is a very good idea. Secondly, we now know not to drive in convoy if it can possibly be avoided. And lastly, we know that, even if it is dangerously hilarious, you do not try to tame the Dethwägøn. Exams are finally over, which is why I can provide you, dear reader, with this photo. 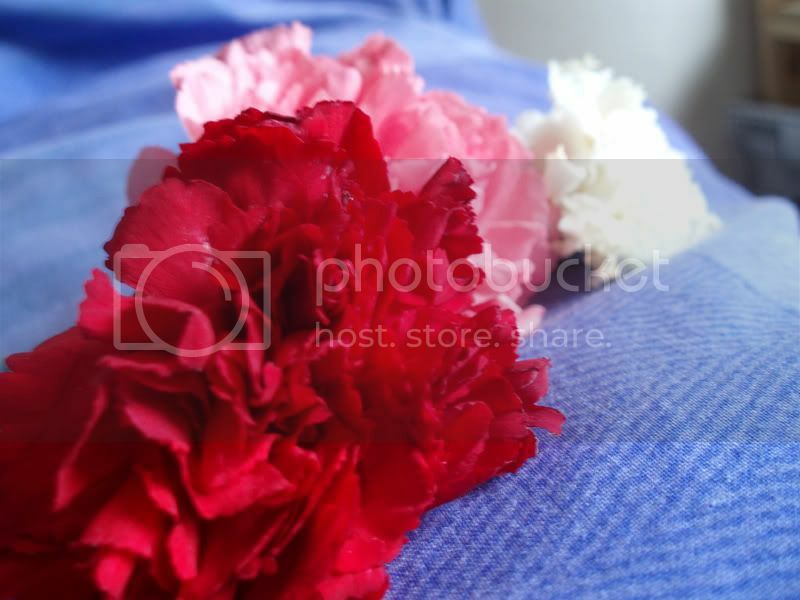 Not hugely interesting to you perhaps, but these three carnations are very significant to me. If you're unfamiliar with Oxford's very odd exam traditions, the first thing that you should know is that they involve wearing formal academic dress, also known as sub fusc. This does have the unfortunate side effect of making all the students look rather like very well-dressed penguins, but it at least means that you're so busy smiling for the tourists as you head for your exam that you aren't worrying about the upcoming terrifying ordeal. The more immediately relevant tradition involves wearing the carnations you see here - white at first, pink for exams up until and including the penultimate, and a red one to finish. This means that you there is a handy colour code so that you know which random strangers to congratulate. (It does happen...) These rather tired-looking flowers are, then, my reminder that I have now completed my degree, and that I'm shortly going to be the recipient of a rather nice BA certificate, which is extremely bizarre. *What have studies of the psychological refractory period (PRP) revealed about the nature of the central bottleneck underlying limitations in dual-task performance? To what extent have studies of 'the conflict situation' helped us to understand how the information from different sensory modalities is integrated? What contributions to the understanding of multisensory perception/integration have emerged from recent studies of multisensory aspects of flavour perception? *What evidence is there to support the notion that supra-additive and sub-additive interactions modulate multisensory perception? Which aspects of synaesthesia are satisfactorily accounted for by cognitive neuroscience models? Which are not? *Why is it so difficult to have a conversation on a mobile phone while driving? Evaluate the evidence that listening to the radio or conversing with a passenger has a similar deleterious effect on driving performance. What are Block's 'two neural correlates of awareness'? How do they relate to neuropsychological, psychophysical and physiological evidence? Discuss the difficulties in devising a measure of awareness that captures its subjective nature. How is vision degraded in blindsight? What are the implications for drawing inferences about the neural basis of visual awareness? *How would you account for the lack of awareness in visual neglect? *Discuss the role of sensory memory in visual detection and discrimination. Describe and evaluate an alternative account. *Evaluate current neural models of perceptual decisions. To what extent do they shed light on possible mechanisms underlying perceptual awareness? *What are 'critical bands' in audition? How are they measured? The most detectable sound centred on a given frequency has a narrow bandwidth but the loudest has a broad bandwidth. Why? *In the content [shurely "context"? Ed.] of hearing research, what is the 'residue' and how is it measured? How are the absolute threshold of hearing, frequency resolution, and amplitude resolution related to the frequency and amplitude of the pure tones? What has been the role of Fourier analysis in the study of hearing? *How do we localize sources of pure tones? What specifically is the role of head movements in sound localization? But...but it features ninjas. How can it be bad? Unrealistic Life Ambitions, No. 153: Get an actual, physical valley renamed "The Uncanny Valley"
There's a concept in robotics known as the "Uncanny Valley", which basically states that as humanoid robots get more and more realistic, people will become more and more comfortable with their presence - right up until the point where they are almost perfect. At that point, they are near enough to being human to make it seem like they actually are human, but...slightly "off" in some way. It's this that's supposed to be so uncanny, the feeling that although things seem almost normal, there is something very subtly but very deeply wrong. I think that's been reached in a few cases (see this video for an example of AAAGH GOOD GRIEF IT'S ALIVE), but perhaps more interestingly, the same principle is also applicable to other situations. The experience of visiting another place, another culture, is one that can often qualify as "uncanny". The only places outside the UK that I've visited for more than a day at a time definitely count, these being Uganda (a former British colony, where everyone drives on the left, the road signs are the same as in the UK, and almost everyone in towns speaks English) and Jersey, where the most obvious cultural ties are to the UK, but things are still...very slightly odd. The most obvious way you'll see the difference if you visit is in the amount of influence France has had on the island. Being so much nearer to France than to the UK mainland (the French coast is clearly visible from a number of around the island, whereas I don't think England is at all), it's not at all unusual for street names, castle names and geographical features to have French names, or sometimes names in the closely-related dialect of Jèrriais. Less obviously, but arguably more importantly, Jersey Legal French is the official language of legislation and so on, meaning that buying a house on the island involves negotiating in a completely different language to the one that you're used to. Some of the little twisting lanes in the villages even look like they're in France - and yet, everyone's speaking English, the signs are in English, and the general culture is undoubtedly that of Middle England, just with a dash of extra sunshine. The sunshine, in fact, is another oddity. Being so far south (about 100 miles south of the UK mainland), the climate is generally much more pleasant than what we're used to over here, and your shadow is noticeably smaller. It's also much easier to get sunburnt - I'm still a bit pink, and I was there a whole 2 weeks ago now. But because the sea is always so close, the climate is variable enough that, just as in the UK, the weather is a major topic of conversation, as it can turn horrible very quickly. The fact that the island is so small - nine miles by five, meaning that it is sadly far too tiny to put the whole world on it - has more effects than just on the weather. 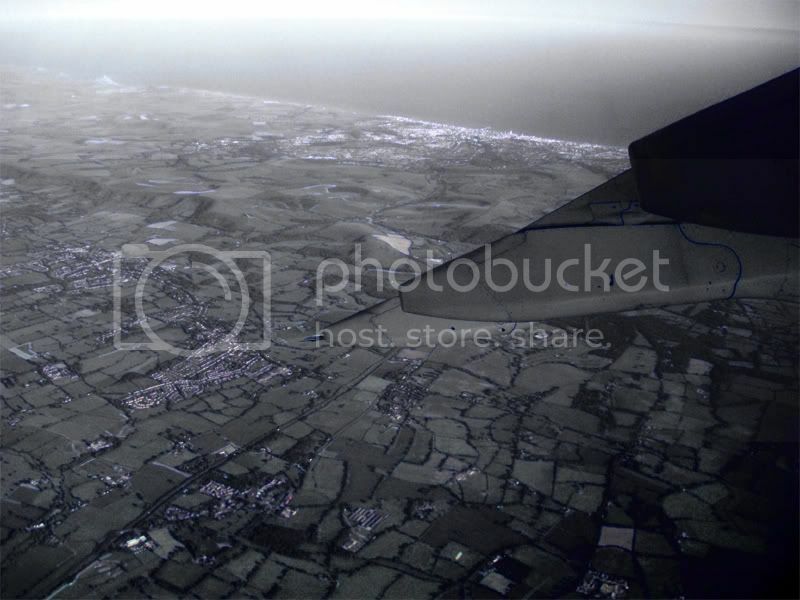 Despite the strict speed limits and tiny twisty roads (and often heavy traffic), it is still perfectly possible to get from one side of the island to the other in under half an hour, meaning that all of the kinds of terrain present, beach, cliffs, fields, small hills and towns, are crammed in right next to each other. The ability to walk out of a town and suddenly be in rural countryside, with seagulls wheeling overhead, is downright weird. The last aspect of out-of-key-ness that you'll find on Jersey, and possibly the msot disturbing one, is the quiet. The island's status as a tax haven means that the population demographics are skewed towards the richer end of the spectrum, and that in turn means that quite a lot of the property is owned by the kind of person who actually lives in, say, the Algarve, and jets in occasionally to check how their cash is getting along. The effect of this is to make the villages into very well-kept and very smart ghost towns - you can walk along the road, with nothing but the odd shiny 4x4 swishing by, and see only other tourists pottering about. In its own way, it's a little sinister. You half expect to see Hercule Poirot strolling down the road, ready to interview the dysfunctional group of suspects who have gathered in the drawing room to discover who has committed the terrifying, gruesome murder. Meanwhile, just down the road, St. Helier (the only town of any note) is pretty much like any other town in the UK. Jersey's a lovely place, in its own way, but it really is odd. It's not quite Britain, but it's not remotely France - it's just a bit otherworldly, almost outside the normal rules of time and space. It's really not at all surprising that it's a popular tourist destination...but I do find it odd that people from the UK do frequently end up settling there. You'd have thought that they would have had enough weirdness with the state of their home country, really. Things are a little hectic down my way at the moment - final exams are just around the corner, and any time that I don't spend revising is generally spent far too tired to be doing much else. 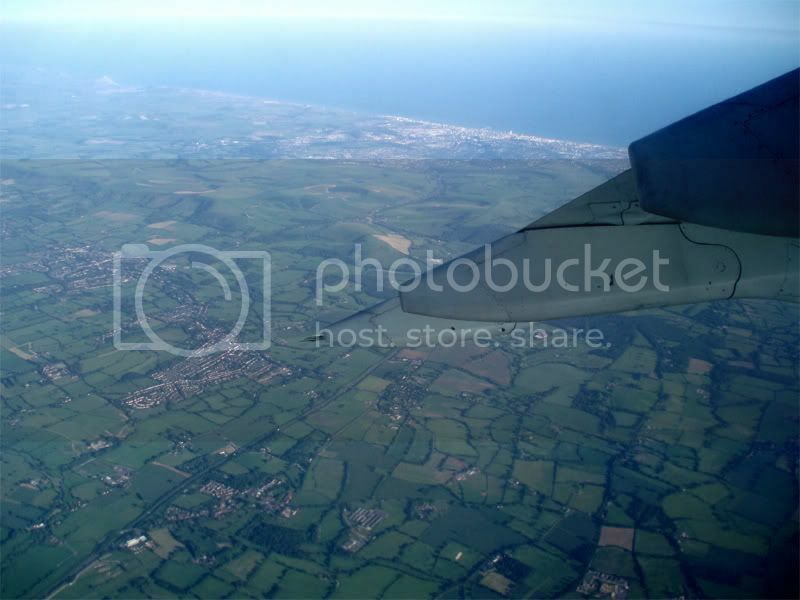 I'm therefore going to have to mine last weekend's trip to Jersey for a little more material (more will follow, believe me...), by including this picture that I took from the plane on the way home. If I remember correctly, that's Brighton over in the distance. It's strange, really, that even so close to a fairly large city, the most immediately obvious feature of the landscape is acre upon acre of green fields. You'd never believe that the UK was one of the most crowded countries in the world just to look at it, but in pure population density terms that really is the case. Looks like we've got quite a bit of space left, though.